IPM Laboratories, Inc. produces 7 species of beneficial organisms and distributes more than 50 other species. 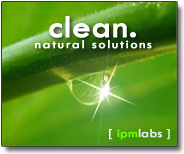 IPM Laboratories, Inc. was founded in 1981 as IPM Services and offered pest management and consulting. In 1985 we began producing beneficial insects and incorporated under our current name. In 1988 we published our first catalog and newsletter for the greenhouse and nursery industry. Today we supply beneficial insects and information (in the form of articles, fact sheets and conference presentations) on integrated pest management, individual pests and environments. Our region is nationwide. Founder and president Carol Glenister is a pioneer in commercial biological control and IPM. She has been strongly dedicated to the study and promotion of biological control since 1974. An IPM consultant since 1981, she has a Bachelor of Science from SUNY College of Environmental Science and Forestry and a Master’s Degree in Entomology from Cornell University. Past president and current member of the Association of Natural Bio-Control Producers (ANBP) Board of Directors. There is a concerted effort by members of the ANBP to build an ethical and technical framework that will foster excellence in the industry. The ANBP is the only professional organization representing the biological pest control producers in North America. Formed in 1990, ANBP has about 100 members, 37 of which are producers or suppliers. Primary goals are advocacy for the production and use of biological controls, work on regulatory issues facing the industry, communicating with the research community, and supporting quality assurance development.